The most advanced hearing aids represent highly technological and sophisticated devices. Unfortunately, this also leads to a price tag that put them beyond the means of many people. Entry-level or economy hearing aids are still able to significantly improve the lives of wearers, including veterans and pensioners who can access free economy hearing aids through the Office of Hearing Services Voucher Scheme. Here we provide our best choice for clients on tighter budgets. Unitron Stride M500 hearing aids offer big performance at an affordable price in one of Unitron’s smallest ever behind-the-ear models. With the natural sound of the North platform, a telecoil for those who need it, and technologies that work together to let you focus on conversations, Stride M has everything you need to capture, and keep, your interest. Adaptive Directional: Directional strategy that tracks and suppresses multiple background noise sources. Frequency Compression: Compresses and shifts inaudible high frequency sounds into a more audible lower frequency region. AntiShock: Eliminates discomfort from sudden impulse noises. Natural Sound Balance: Makes precise adaptive adjustments to preserve one clear, balanced signal. Wind Control: Helps enhance user enjoyment outdoors, by suppressing wind noise that can become cumbersome over time. Tinnitus Masker: Emits a soft noise that is designed to distract attention away from an individual’s tinnitus. IP67 Water & Dust resistance: High rating for water resistance, particularly for an economy level device. SoundNav: identifies and classifies signals into seven distinct environments, four of which are specifically focused on conversations. SoundConductor: dynamically balances adaptive features to address each unique listening scenario. MyMusic: This feature provides users with enhanced music listening, and is based on his or her preferences. SpeechZone: This feature activates the hearing aid’s maximum directionality to help users focus on speech, even in extremely noisy, difficult hearing situations. 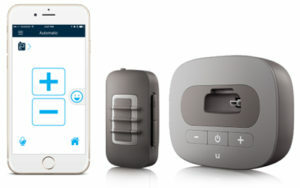 uControl App: Turns any smartphone (Android and iOS) into a remote control for clients with Phonak Venture hearing aids. This provides your clients with more control and flexibility. uStream: Patients experience stereo sound through easy, more discreet connectivity to wireless devices, like mobile phones, TVs and Bluetooth MP3 players. uTV: Patients experience stereo sound through easy, more discreet connectivity to wireless devices, like mobile phones, TVs and Bluetooth MP3 players.